Hang onto that bull rope because your pre-event promotions are about to go buck wild! 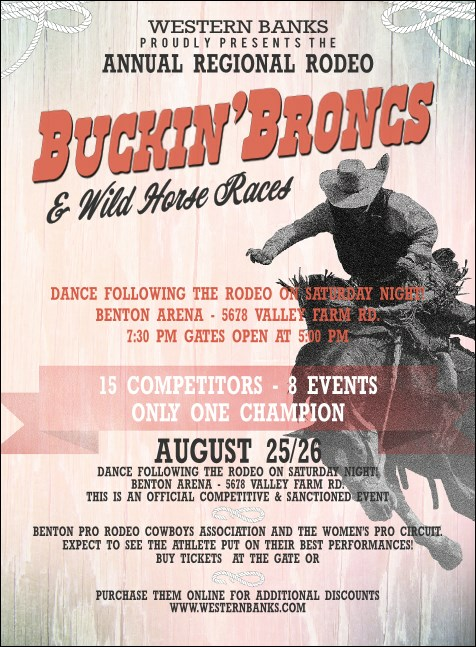 Print Bucking Bronco Rodeo Invitations and post them in advance to boost attendance at your event. With a rustic, yet elegant, light-colored wooden background and a black and white picture of rider on his bronc, these Invitations take advertising to the next level. TicketPrinting.com helps you handle the roughest stock.